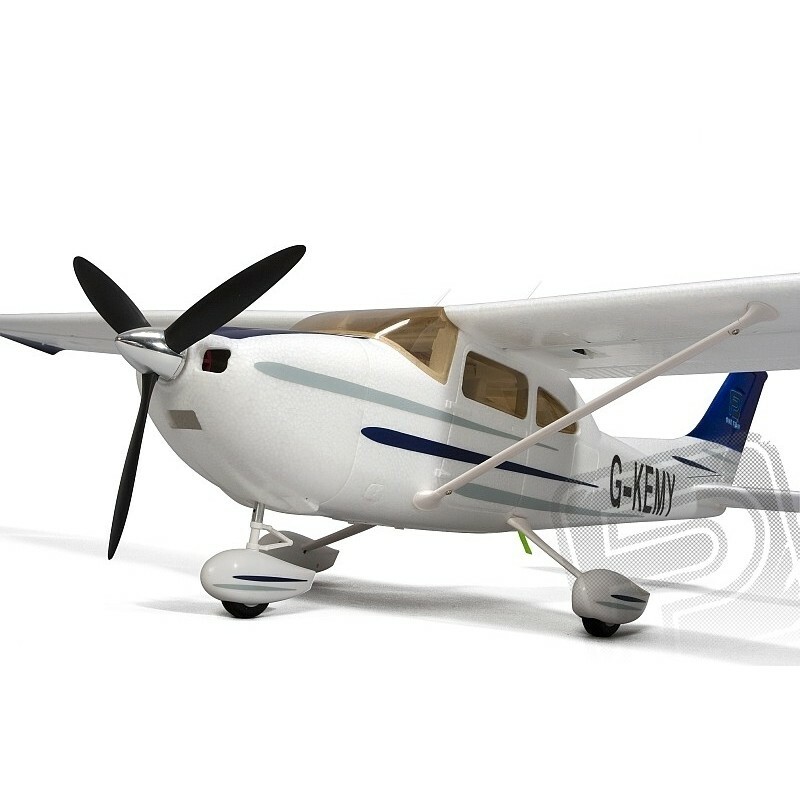 Like the Piper Cub, the inherent symbol of the 30's and 40's, from the 1950s to the present, is the icon of Cessna's general and sport aviation. 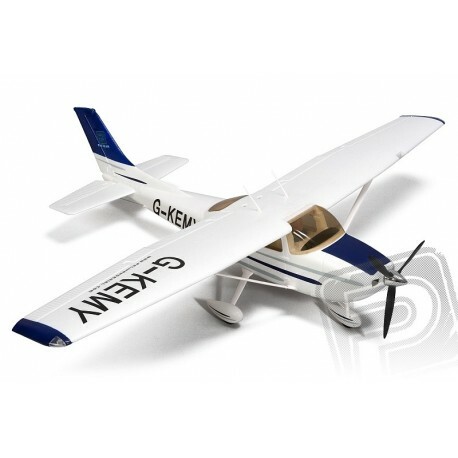 Since 1956, more than 24,000 different versions have been produced with the traditional name Skylane. 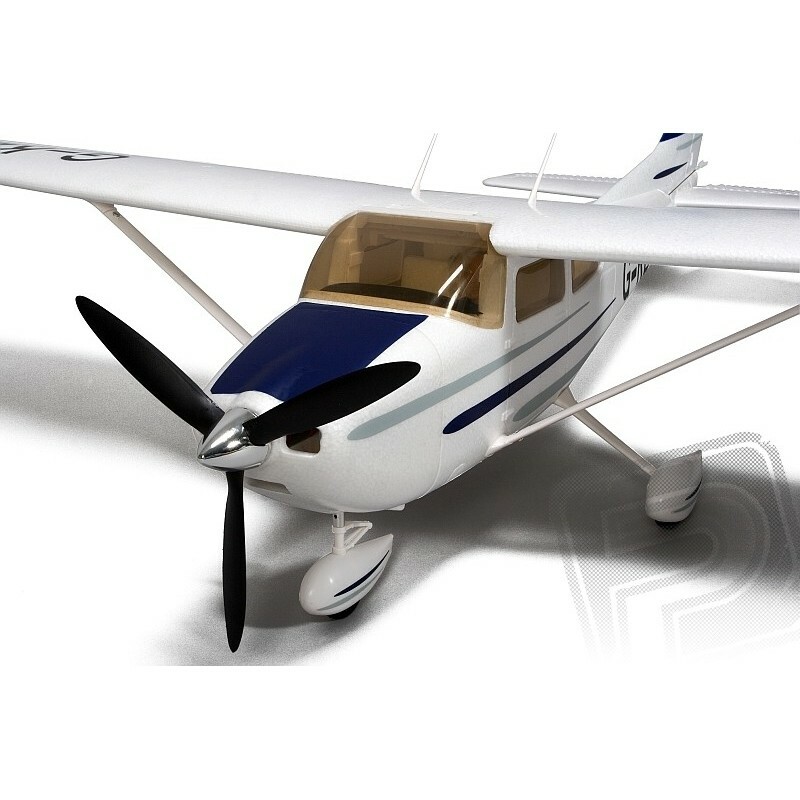 Throughout the long period, engines, interior equipment and construction have changed, but the characteristic features of a high wing with a three-wheeled chassis, a large and richly glassed cabin and a flat-bladed engine in the bow are still readily recognizable at first glance. 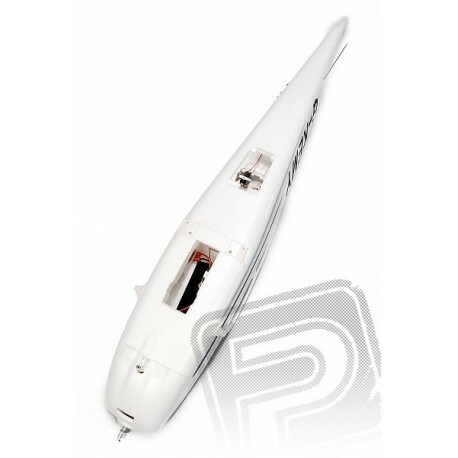 The fuselage EPP model fuselage comes with a rotary jack (AXI 2814 or RAY C3536) mounted, with an alternating AC regulator and rudder and elevator servos. In the lower part of the fuselage, there is space for batteries easily accessible thanks to the removable plastic cover. 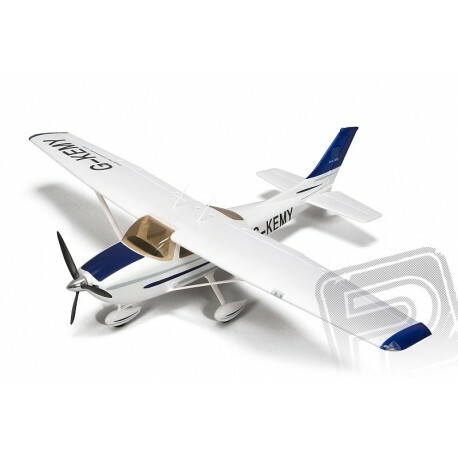 For Cessna, you will need Li-poly 3-cell batteries at least 1800 mAh with a 20C capacity, but "take" even larger 3-cell batteries 2000-3300 mAh, with which the flight time is prolonged. The EPP engine cover is detachable, fixed by a pair of magnets on the sides. Tail seals of EPP are fastened by gluing into molded slots and grooves in the fuselage by means of the contact adhesive supplied in the kit or medium-second adhesive." The rudder and elevator elevator can be accessed by removing the cap with magnetic cap on the underside of the fuselage behind the cab. The wing is also made of foamed EPP with semi-directional profile, two-part, connected by a tubular carbon clutch. Two pins are fastened to the fuselage at the front and 2 bolts at the rear. Ailerons and flaps are always controlled by two servos mounted in the wing with short straight wire rods. Prior to attaching the rods, we recommend that the rudders "move" repeatedly with cautious upward and downward deflection, respectively. left and right. The three-wheeled chassis with a bowed head is wired, with elegant plastic covers ("boots"). Ailerons, flaps, rudder, elevator and engine speed are controlled. 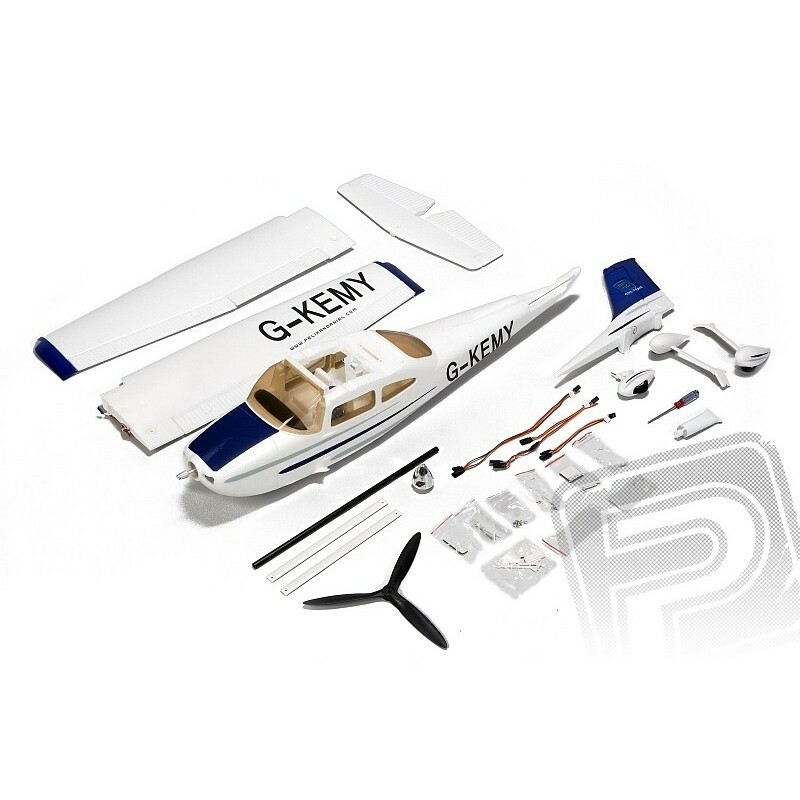 To control the model, you will need at least a six-channel, but rather a seven-channel RC kit that allows independent control of aileron and flap servos. In this case, you can set a differentiation of aileron deflections; we recommend 10-20% for the beginning - ie, the aileron deflection is slightly smaller compared to the upward displacement. This will make it easier to control the model, which will have a lesser tendency to spin off the turn. You can also achieve a similar effect using the Aileron-Ruler Mixer. 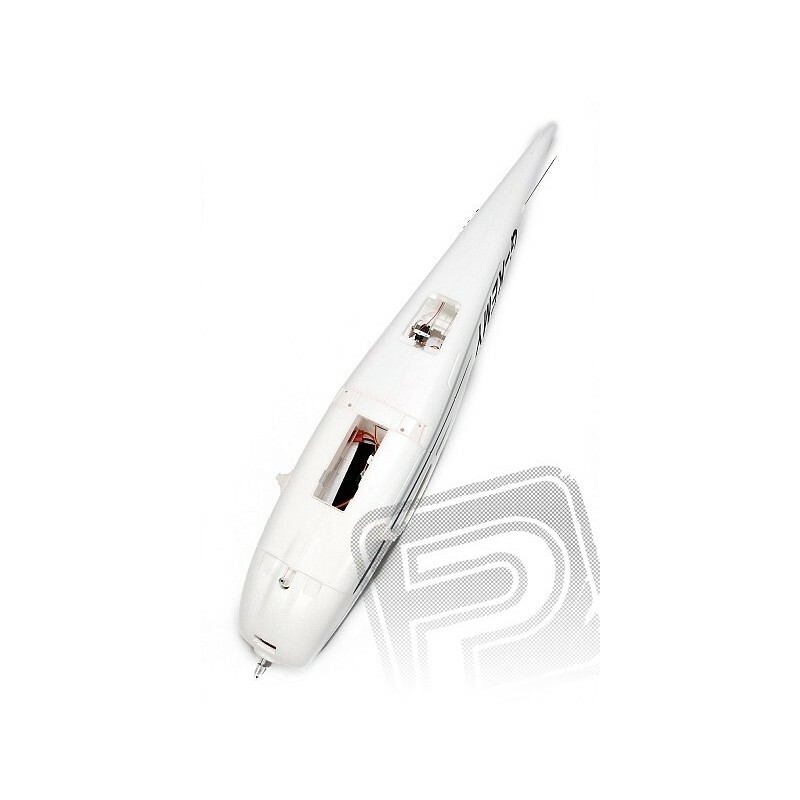 Lamps do not require any special control channel, they are connected to the free channel of the receiver, or by a Y-cable, for example, to the rudder channel. Cessna 182 is designed for mildly advanced modellers. The model, as a semi-cluster of the sporty "box-like" high wing, introduces you to some of the features that are typical of similar machines - you will be required to properly coordinate the model with a rudder, aileron and elevator. This experience "as you find" at the latest after you start flying with your first acrobatic model or (semi) mock-up of any kind. Nice to get used to the fact that knips on the transmitter are not for decoration, but to be used in the right way and at the right time." It's cruel to us, but you'll be grateful later. Her domain is, of course, a quiet flyover that gives you and colleagues at the airport plenty of time to enjoy its graceful shapes, but after a little "kick-off" it reliably manages the looping, twisting curves and the barrel curve. Just a sporty mountain hovercraft, how it should be! The ARF kit includes: a finished model with an alternating motor, three-blade propeller with a cone, a speed controller and 6 servos, a set of small accessories and extension cables and instructions. Programmable digital picoservo 9.5g with metal gears for hall electrolights, throwers and micro helicopters. 1xBB, thrust 1.3 kg / cm, speed 0.20s / 60th at 4.8V. Strong digital microservo 12g with metal gears for electrics, gliders and small helicopters. 1xBB, pull 1.8 kg / cm, speed 0.11s / 60th at 4.8 V. Programmable. Strong digital microservo 22g with metal gears for electrics and gliders. 1xBB, pull 3.6 kg / cm, speed 0.17s / 60th at 4.8 V. Programmable.